Valentine's Day will be here before you know it! The Occasions Catalog has some great Valentine's and romantically-themed products in it, but you haven't forgotten about all your great products from the big catalog have you? 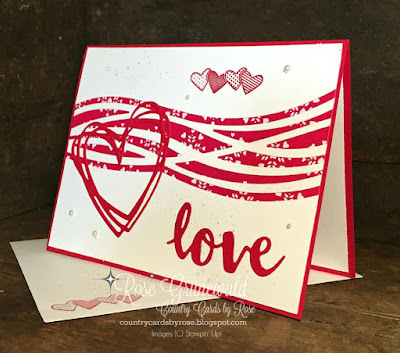 Today I have a tutorial for a card I made that features something new from Occasions (the Sending Love DSP behind the swirly wave) and some "old" product from the big catalog - Swirly Bird Thinlets and Sunshine Wishes. Die cut the 5 ¼” x 3 ¾” Whisper White cardstock with the waves from the Swirly Scribbles die set – keep the whisper white portion above and below the wave for your card front. Die cut the heart and “love” from scraps of Real Red cardstock. 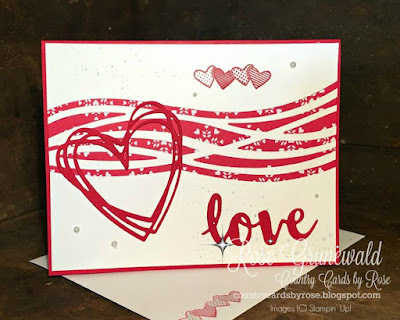 Using Real Red ink, stamp hearts from Sealed with Love stamp set to the blank space above the Swirly Scribbles wave. 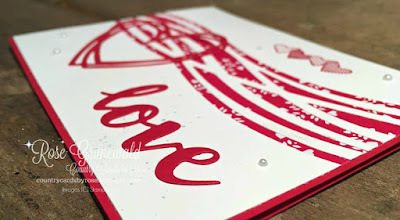 Create a splatter diagonal across the card using the Soft Sky Stampin’ Write marker. Assemble the Whisper White wave along with the pieces from above and below the wave on top of the Sending Love DSP and adhere. Make sure the top and bottom edge of your Whisper White match up with the top and bottom edge of the Sending Love DSP. Adhere die-cut heart and “love” to Whisper White cardstock. Adhere card front (whisper white over DSP with diecuts) to Real Red card base. Place 5 Basic Pearl Jewels in various empty spaces on card front. Stamp solid hearts in Soft Sky and patterned hearts in Real Red onto the bottom left corner of your envelope. So go dust off those dies and stamp sets from the big catalog and combine them with your new goodies! The creative possibilities are endless!